One of the most well known wine grapes in the world, one that crafts the age-worthy collectibles of Bordeaux and California, the red variety we call the “King of Grapes,” a grape planted in just about every wine growing region in the world, and the grape that has it’s own day (August 30) to celebrate it. That’s right. We’re talking Cabernet Sauvignon. But from where did Cabernet Sauvignon originally hail? Due to its popularity and its ability to grow in so many places, one would think it dates back to the beginning of wine as we know it. 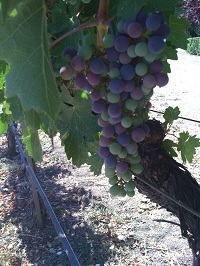 But in fact, Cabernet Sauvignon is a fairly recent variety. Thanks to DNA testing, we now know that it spawns from a crossing between Cabernet Franc and Sauvignon Blanc. Seems obvious given the name, but fascinating nonetheless. The grape can have what we call a “bell pepper” characteristic, something found in both Cabernet Franc and Sauvignon Blanc. Cabernet Sauvignon established itself as one of the premier wine varieties of the world by having a number of distinguishing characteristics. 1. Thick skin, big pips. Kind of metaphor in our own life, too – you need those things to survive, flourish and become king, which defines Cabernet Sauvignon in the grape world! With a high pip to pulp ratio, and those thick skins, the grape is super high in phenolics. That makes wine with lots of color and pretty significant tannins. 2. A “varietal” flavor blended with a reflection from where it’s grown. This may sound like every grape, but Cabernet Sauvignon is in fact unique in this. Not only does it taste like Cabernet Sauvignon, it tastes like the region from which it comes. 3. Ageability. Chalk that up to those thick skins and big pips. High phenolics can make a wine that ages, and ages well. Examples of course are Bordeaux, some California Cabernet, and more new world bottlings that are proving what the grape can do. Cabernet is also a blender. Rarely does it produce top quality wines on its own (though it can). Instead, it is backed by supporting roles from grapes like Merlot, Cabernet Franc, Malbec, Petit Verdot and, in the new world regions, grapes like Syrah and Carmenere. It is one of the most well-known grape varieties in the world. It’s unique, yet adaptable. It graces many a table, pairs well with a steak and is a go-to bottle for many. So stock up on some Cabernet and celebrate the King of Grapes on August 30.